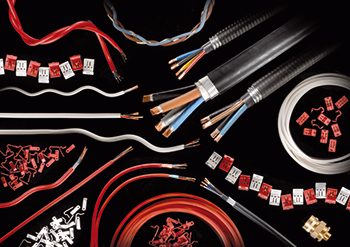 Prysmian’s cable product ranges and accessories ... enhanced fire resistance properties. Fire-resistant cables enable life safety systems such as fire alarms to operate in the event of a fire. However, without fire-resistant cable supports, there is a danger that the system could be compromised, explains ALASTAIR FREE from Prysmian Group. While the long-anticipated publication of the revised UAE Life and Fire Safety Code last year focused attention on cladding and other building materials, there is also a need to consider interior details that can have a dramatic impact on the safety of building occupants. As the world’s largest manufacturer of electrical cable and fixings, Prysmian finds that engineers in the region are well versed in the range of fire-performance cables, but less familiar with the need to use fire-performance fixings or with the performance standards that differentiate the quality of different products. When fire-resistant cable is used to ensure fire alarm and emergency lighting systems continue to operate in a fire, the cable needs to be fixed securely to the fabric of the building with clips that are also resistant to fire in order to maintain the integrity of the circuit. If inadequate fixings fail in a fire and the cable falls, then strain is put on every element of the circuit and it can fail, risking cutting off vital evacuation and life-safety equipment. Cable supports are also essential where wiring is installed in corridors, stairways and other escape routes because fallen or hanging cables pose a lethal danger to people trying to escape and to the firefighters entering the building to manage the fire. Fire-resistant cable supports should be capable of operating at a similar temperature and for a similar duration as the fire-resistant cable they carry. As a general rule, fire-resistant cables should be fixed using metal fixings made from copper, stainless steel or galvanised cast iron such as those manufactured by Prysmian Group in its Bicon range. Galvanised iron claw cleats and two-bolt cleats are also available for larger cables with diameters of 10 to 54 mm. It must be noted that aluminium is an unsuitable material for fire-resistant fixings because of its low melting point. Prysmian recognises that the performance of any cable installation relies as much on the quality of the supports as on the quality of the cable. Because of this, the company invests a substantial amount of effort and cost in the testing and approval of the cable and its supporting system. It can be difficult for specifiers and installers to differentiate a high quality product from a substandard option, particularly in a global market where different national standards apply to individual products. Prysmian advises its customers to focus on the documentation behind any manufacturer’s claims. The company’s Bicon cable accessories are manufactured to internationally accepted British and European Standards, including BS EN 62444:2013 cable glands for electrical installations; BS EN 61238-1 compression and mechanical connectors for power cable; BS EN 61914 cable cleats for electrical installations; and BS EN 50393 low-voltage joints. In a global market, it is always possible to source low-cost products that appear to meet accepted international standards but may, when tested, prove inadequate. Common reasons that lower quality fixings fail relevant performance tests typically relate to the materials used in manufacture, including the use of poor quality recycled metals that do not perform adequately in a fire. Equally challenging for the purchaser is incorrect product labelling or ambiguous marketing that can mislead and result in the final installation failing to meet the original intention. This is a huge concern for manufacturers of genuine, high-performance fire-resistant cables and cable supports, because cable accessories are not specific to individual cable brands. Prysmian’s advice would always be to use cables and accessories from a single manufacturer: then the user can be assured that the entire system will be designed to function as a single unit and will not be compromised by a single weak link. Historical test data is an indication of a secure track record of high quality production and rigorous product testing – in some cases going back through previous brand identities. The Bicon product range is the result of over 100 years of development and engineering, started by BICC and continued in the 21st Century by Prysmian Cables and Systems, UK. Prysmian’s full range of cable accessories including cable glands, cleats, joints and connectors have been marketed under the Bicon brand since that time. The BICC name no longer has any association with the Prysmian Group or its range of cable accessories. Specifiers and contractors should contact the cable manufacturer if in doubt about the suitability of a particular fixing for a specific cable application.